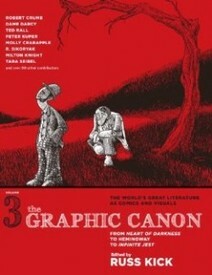 The Copacetic Comics Company | The Graphic Canon, volume 3 by R.
The mammoth sized (542 pages) third and final volume of the Graphic Canon has arrived; chock-a-block with comics adaptations, illustrations and illuminations of 20th classics of literature. 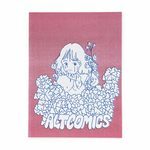 Highlights among the dozens of featured teamings of artists and writers are: Milton Knight & Zora Neale Hurston; Mardou & Anaïs Nin; R. Crumb & Jean Paul Sartre; R. Sikoryak & Franz Kafka; Ted Rall & Sherwood Anderson; Lauren Weinstein & W.B. Yeats; Onsmith & J.G. Ballard; Aidan Koch & Ben Okri; Jeremy Eaton & Flannery O'Connor; Robert Goodin & William Faulkner; Lance Tooks & Somerset Maugham; Dame Darcy & Cormac McCarthy; CMU alum, Juliacks & Hubert Selby, Jr.; and many more!